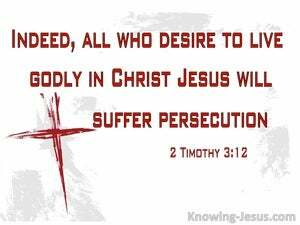 ﻿ 2 Timothy 3:12 And all indeed who desire to live piously in Christ Jesus will be persecuted. Indeed, all who want to live a godly life in union with the Messiah Jesus will be persecuted. And also all those who want to live devoutly in Christ Jesus will be persecuted. Indeed all who delight in piety and are determined to live a devoted and godly life in Christ Jesus will meet with persecution [will be made to suffer because of their religious stand]. In fact, everyone who wants to live a godly life in [the service of] Christ will be persecuted. And all that will live godly in Christ Jesus, shall suffer persecution. Yes, and all whose purpose is to be living in the knowledge of God in Christ Jesus, will be cruelly attacked. and those who will live like Christians, shall generally suffer persecution. But truly all wishing to live godly in Christ Jesus will suffer persecution. Yea and all that are resolved to live godly in Christ Jesus, shall suffer persecution. 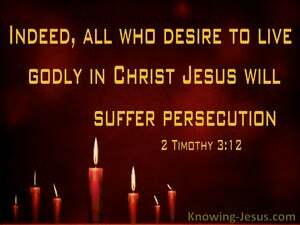 And all that desire to live godly in Christ Jesus shall also suffer persecution. And all wishing to live devotedly in Christ Jesus shall be driven out. And indeed, all those who want to live in a godly manner in Christ Jesus will be persecuted. Yea, and all who desire to live godly in Christ Jesus will be persecuted. Yea, and all that will live godly in Christ Jesus, must suffer persecutions. Yes, and all who want to live the religious life in Christ Jesus will be persecuted. Yes, and all who purpose to live a godly life in Christ Jesus will be persecuted. Now in fact all who want to live godly lives in Christ Jesus will be persecuted. Yea, and all that desire to live godly in Christ Jesus will suffer persecution. And all who will live piously in Christ Jesus shall be persecuted. And all indeed who will live godly in Christ Jesus will be persecuted. And all indeed that will live godly in Christ Jesus will suffer persecution. And indeed every one who is determined to live a godly life as a follower of Christ Jesus will be persecuted. Yes, indeed, everyone who wants to live a godly life as a follower of Christ Jesus will be persecuted. Yea, and all who wish to live godly in Christ Jesus will be persecuted. And indeed all, that are desirous to live godly in Christ Jesus, shall suffer persecution. 11 persecutions, sufferings: what sufferings happened to me in Antioch, in Iconium, in Lystra; what persecutions I endured; and the Lord delivered me out of all. 12 And all indeed who desire to live piously in Christ Jesus will be persecuted. 13 But wicked men and juggling impostors shall advance in evil, leading and being led astray. The wicked plotteth against the righteous, and gnasheth his teeth against him. Blessed they who are persecuted on account of righteousness, for theirs is the kingdom of the heavens. and ye shall be hated of all on account of my name. But he that has endured to the end, he shall be saved. Then Jesus said to his disciples, If any one desires to come after me, let him deny himself and take up his cross and follow me. These things have I spoken to you that in me ye might have peace. In the world ye have tribulation; but be of good courage: I have overcome the world. I have given them thy word, and the world has hated them, because they are not of the world, as I am not of the world. For our boasting is this, the testimony of our conscience, that in simplicity and sincerity before God, (not in fleshly wisdom but in God's grace,) we have had our conversation in the world, and more abundantly towards you. And confessedly the mystery of piety is great. God has been manifested in flesh, has been justified in the Spirit, has appeared to angels, has been preached among the nations, has been believed on in the world, has been received up in glory. For what glory is it, if sinning and being buffeted ye shall bear it? but if, doing good and suffering, ye shall bear it, this is acceptable with God. Whom resist, stedfast in faith, knowing that the selfsame sufferings are accomplished in your brotherhood which is in the world. And I said to him, My lord, thou knowest. And he said to me, These are they who come out of the great tribulation, and have washed their robes, and have made them white in the blood of the Lamb.